A recent mathematical analysis says that life as we know it is written into the laws of reality. 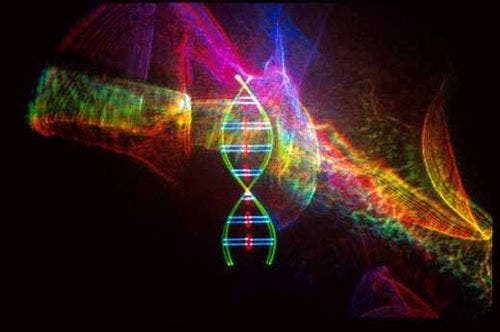 DNA is built from a set of twenty amino acids – the first ten of those can create simple prebiotic life, and now it seems that those ten are thermodynamically destined to occur wherever they can. For those unfamiliar with thermodynamics, it's the Big Brother of all energy equations and science itself. You can apply quantum mechanics at certain scales, and Newtonian mechanics work at the right speeds, but if thermodynamics says something, then everyone listens. An energy analysis by Ralph Pudritz, a theoretical astrophysicist and director of the Origins Institute at McMaster University shows that the first ten amino acids are likely to form at relatively low temperatures and pressures, and the calculated odds of formation match the concentrations of these life-chemicals found in meteorite samples. They also match those in simulations of early Earth, and most critically, those simulations were performed by other people. The implications are staggering: good news for anyone worried about how we're alone, and bad news for anyone who demands some kind of "Designer" to put life together – it seems that physics can assemble the organic jigsaw all by itself, thank you very much, and has probably done so throughout space since the beginning of everything. The study indicates that you don't need a miracle to arrive at the chemical cocktail for early life, just a decently large asteroid with the right components. That's all. The entire universe could be stuffed with life, from the earliest prebiotic protein-a-likes to fully DNAed descendants. The path from one to the other is long, but we've had thirteen and a half billion years so far and it's happened at least once. The other ten amino acids aren't as easy to form, but they'll still turn up – and the process of "stepwise evolution" means that once the simpler systems work, they can grab the rarer "epic drops" of more sophisticated chemicals as they occur – kind of a World of Lifecraft except you literally get a life when you play. And once even the most sophisticated structure is part of a replicating organism, there's plenty to go round. Early Earth was covered with carbonaceous material from meteorites and comets that provided the raw materials from which first life emerged. In his new book, The Eerie Silence, astrophysicist Paul Davies of Arizona State University suggests that the original cells would have been able to pick and choose from the early Earth's organic cocktail. To the best of our knowledge, he writes, "the twenty-one chosen by known life do not constitute a unique set; other choices could have been made, and maybe were made if life started elsewhere many times."